An outsourced CIO can deliver competitive endowment returns and a consistent, validated, and transparent approach to investing. 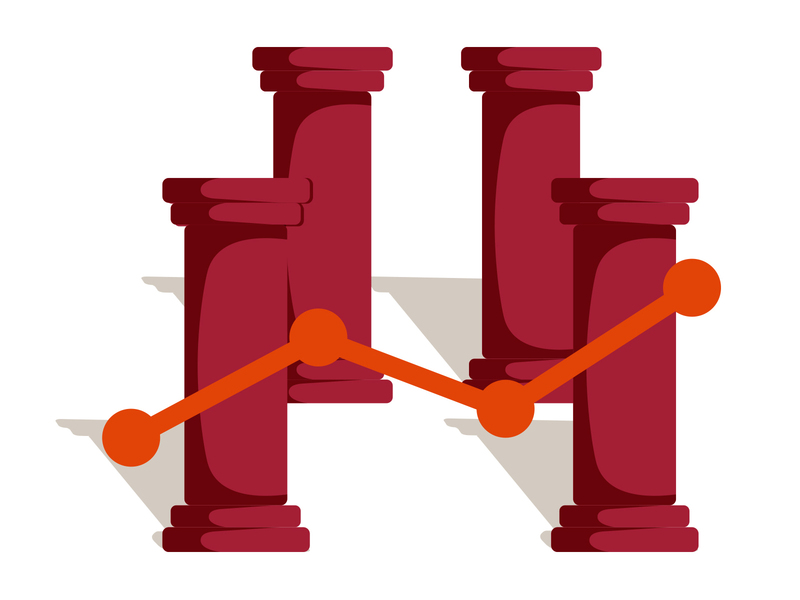 Since the mid-1980s, the legendary Yale endowment model has been the dominant investment strategy for educational institutions. This shift from publicly traded equities and fixed income securities to alternative strategies worked for Yale and other early adopters. But over the last decade-plus, endowment returns have declined and compressed. Source: Vanguard, using data from the NACUBO-Commonfund Study of Endowments as of fiscal year-end June 30, 2017. 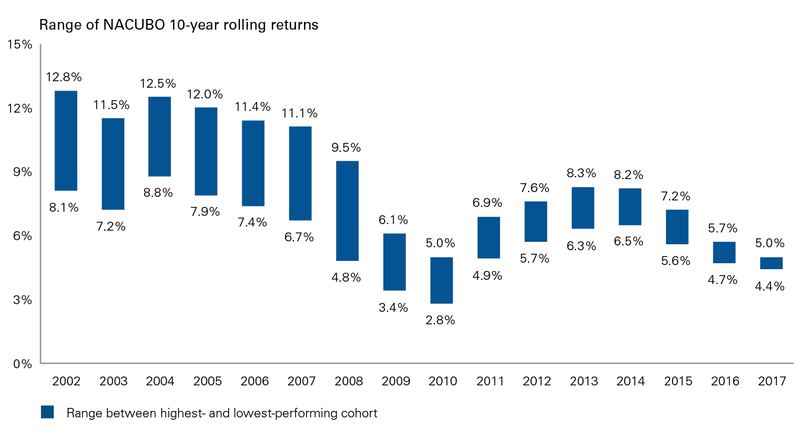 The top and bottom of each bar represents the median return of the best- and worst-performing NACUBO cohort as defined by endowment asset size. The only thing on the rise is investment fees. According to Callan’s 2017 Investment Management Fee Survey, endowments and foundations paid a median of 0.68% in investment fees (not including any other fees to run an endowment), up from 0.55% in 2014. This was nearly twice the fees of corporate and public plans. Trading costs, which typically are not paid directly but rather incurred indirectly, may also be higher with some alternative strategies such as some hedge funds. Fortunately, the endowment model isn’t the only path to competitive results. The right outsourced CIO can deliver competitive results over time while eliminating some of the challenges, uncertainties, and costs that come with a heavy focus on alternative strategies. At Vanguard, we believe four key pillars drive success when acting as a co-fiduciary on an organization’s (or investor’s) behalf. An investment philosophy should be more than simply “maximize returns while minimizing risk.” After all, is there an investor in the world who doesn’t try to follow that philosophy? An investment philosophy should encompass a firm’s core beliefs, which should be constant and consistent, and cannot vary from one consultant or portfolio manager to another. In many cases, inconsistency with the implementation of a prior outsourced CIO has negatively impacted results. At Vanguard, we believe in being compensated for the risks we take in a portfolio and minimizing idiosyncratic or uncompensated risks. 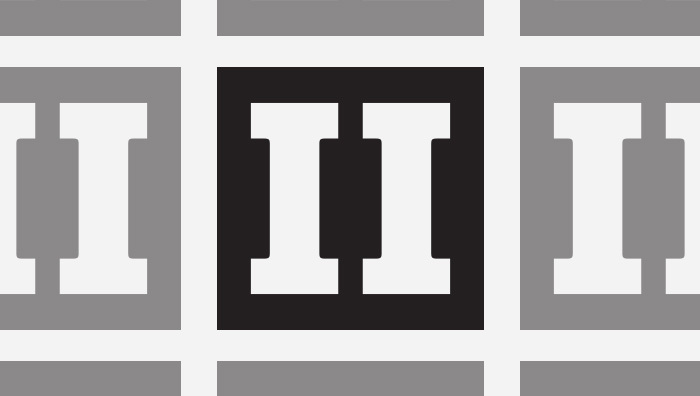 In addition, we believe in identifying a strategic asset allocation that best reflects the objectives and constrains stated in an investment policy statement, and that periodic rebalancing of a portfolio back to that allocation is the single most important—and ongoing—investment task of an outsourced CIO. Does the provider have in-house asset management experience or do they use investment products from other firms? Is there a dedicated risk management function? Do they have an internal investment research team? What is the process and reach of the manager search function? What is the day-to-day operation support structure? An outsourced CIO should be able to demonstrate the value they add in each of these areas. Research shows that cost is the only reliable predictor of future (relative) performance.2 The lower the cost, the greater the chance that you will outperform higher-cost counterparts. Cost is also the most controllable factor in investing. Yet organizations often fail to minimize investing costs. Cost is multifaceted: investment management fees, custody fees, advisory (or staff) fees are just a few. Often, investors pay ancillary fees that are difficult to tease out. At Vanguard, all the services our OCIO clients receive are wrapped into a transparent all-in fee that shows the costs of investments and advice services. Humans err. While intentions are often noble, any asset allocation policy can be undermined by constant turnover of managers and strategies, and too much focus on tactical or dynamic allocations. Policy can also be sidetracked by significant bets on idiosyncratic opportunities led by the allure of exclusivity and the promise of outsized performance. This danger has been substantiated time and again through academic and industry research.3 And yet the urge to act is strong. Among asset managers, institutional consultants, advisors, and investment committees, human behavior is nondiscriminatory. At Vanguard, we champion what we call “behavioral ballast.” Our clients’ success is driven by our commitment to preventing humans from doing human things. Building on the seminal work by Gary Brinson, Randolph Hood, and Gilbert Beebower, Vanguard evaluated the performance of global multi-asset-class strategies, and our research found that, on average, such strategies generated negative alpha per year while realizing greater volatility than their policy benchmark.4 So while Vanguard’s OCIO model may not be as exciting as our tactical or active peers, the evidence is strong that the approach works. It might come as a surprise that at Vanguard, we are not dogmatic about indexing being the only way to deliver long-term success. In fact, Vanguard’s outsourced CIO model includes low-cost active, factors, and liquid alternatives. What’s different is our obsessive focus on strategic, rather than tactical (or dynamic) asset allocation. But don’t take our word for it. Take a look at the chart below, which plots the returns of university endowments relative to the returns for a portfolio using only Vanguard index funds as well as three different portfolios that also include Vanguard active funds. To learn more about Vanguard’s outsourced CIO services for nonprofits, visit our nonprofit solutions site to submit an RFI or contact your local nonprofit solutions director at 888-888-7064 or NPOCIO@vanguard.com. Sources: Vanguard, using data from NACUBO-Commonfund Study of Endowments as of fiscal year-end June 30, 2017. Returns are net of fees. VIAS portfolio model returns assume semiannual rebalancing to target allocations and are net of fund expenses and a 0.08% advisory fee (based on a $75.5 million investment). VIAS clients do not pay commissions or brokerage fees and the model results above therefore do not reflect the deduction of such fees. Advisory fees are subject to change dependent on portfolio size as described in the VIAS advisory brochure. VIAS portfolios are only available to qualified institutional investors with assets starting at $2 million. For additional information on the VIAS advisory fee schedule, please refer to the VIAS advisory brochure available at:https://adviserinfo.sec.gov/IAPD/Content/Common/crd_iapd_Brochure.aspx?BRCHR_VRSN_ID=443326. The VIAS model portfolio returns do not reflect actual trading and may not reflect the impact that material economic and market factors may have had on VIAS’ decision-making had VIAS actually managed client funds during the performance periods displayed above. VIAS portfolios are subject to fluctuations in value and investment losses. The volatility of the VIAS portfolios is materially different from that of the NACUBO institutions' portfolios. NACUBO institutions may have had during the time periods noted above, and may currently have, investment objectives that are not consistent with the VIAS portfolios. Please see the Notes below for additional information about Vanguard model portfolios and NACUBO performance. 2 Wallick, Daniel W., Brian R. Wimmer, and James J. Balsamo, Shopping for alpha: You get what you don't pay for, Vanguard, January 2015. 3 Bosse, Paul M., Douglas M. Grim, Frank Chism, Duty, opportunity, mastery: Investment committee best practices, Vanguard 2017. 4 Scott, Brian J., James J. Balsamo, Kelly N. McShane, and Christos Tasopoulos, 2016. The global case for strategic asset allocation and an examination of home bias. Valley Forge, PA: Vanguard, based upon research completed by Brinson, Gary P., Randolph Hood, and Gilbert L. Beebower, 1995. “Determinants of Portfolio Performance.” Financial Analysts Journal. 5 Jenkinson, Tim, Howard Jones, and Jose Vicente Martinez, “Picking Winners? Investment Consultants' Recommendations of Fund Managers,” Journal of Finance, Vol. 71, No. 5 (October 2016): 2,333-2,370. For more information about Vanguard funds, visit institutional.vanguard.com or call 800-523-7064 to obtain a prospectus or, if available, a summary prospectus. Investment objectives, risks, charges, expenses, and other important information about a fund are contained in the prospectus; read and consider it carefully before investing. Portfolio returns assume semi-annual rebalancing to target allocations, and are net of fund expenses and a 0.28% annual advisory fee (based on a $10 million investment). Portfolio equity allocation is 49% U.S. and 21% international equity through December, 2014; 42% U.S. and 28% international equity thereafter; portfolio fixed income allocation of 30% U.S. fixed income through May 2013, 21% U.S. fixed income and 9% international fixed income thereafter. Returns for Total International Stock Index reflect Investor Shares through November, 2010, Admiral Shares thereafter. Return since inception for Total International Stock Index are for Admiral Shares. The NACUBO institutions' portfolios performance was reported to NACUBO voluntarily by NACUBO member institutions and the performance reported may have been affected by changes in conditions, objectives, or investment strategies during the time period of performance displayed. The NACUBO institutions’ portfolios included in this chart have the following asset allocation on average. 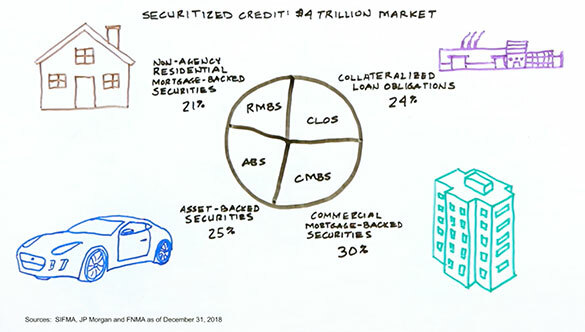 For the $1B cohort: 32% equities, 7% fixed-income, 57% alternative strategies, and 4% in short-term securities, cash, or other types of investments. 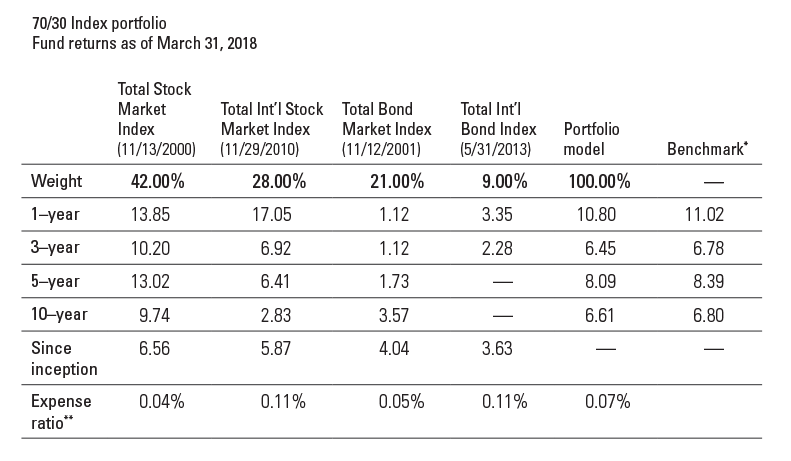 For the total institution cohort: 35% equities, 8% fixed-income, 53% alternative strategies, and 4% in short-term securities, cash, or other types of investments. 86 percent of the $1B cohort and 82 percent of the total study participants reported rebalancing at least once in 2017.